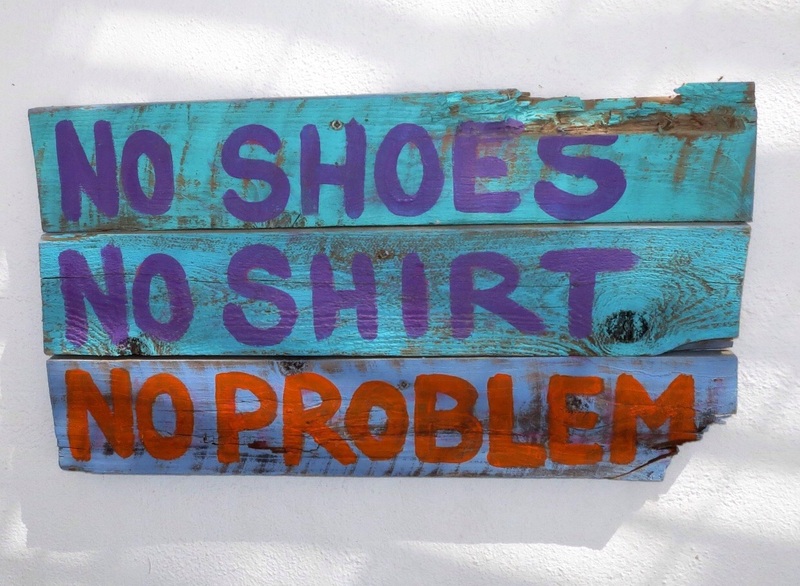 ‘No shoes, no shirt, no problem‘ read the sign on the beachfront cafe. 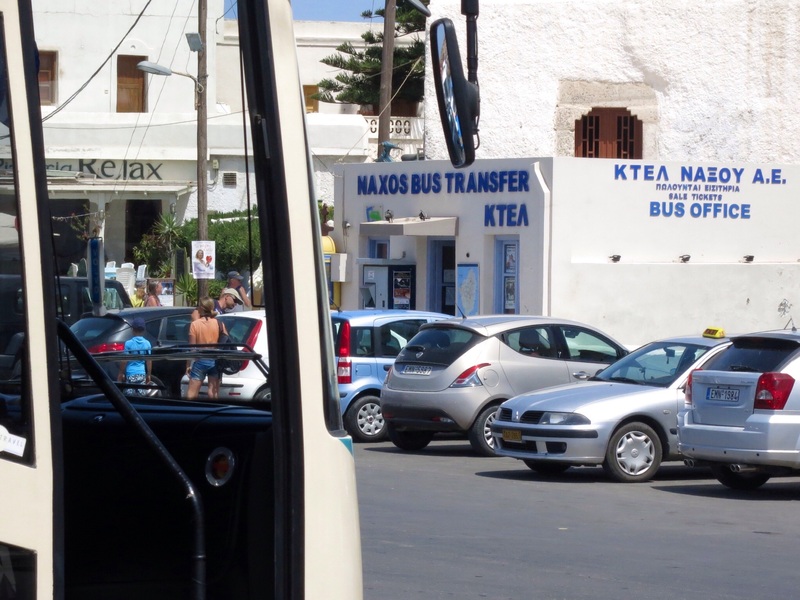 Welcome to Naxos! This stunning Greek island is designed for the ultimate in relaxation. Excellent Greek food and surprisingly good wine, sandy beaches, hundreds of taverns, a stunning port and gorgeous sunsets across the Aegean. What more could you ask for? But there is more; smart bars and night clubs, Venetian castles, old churches, archeological ruins and museums and mountain walks and drives through traditional Greek villages. 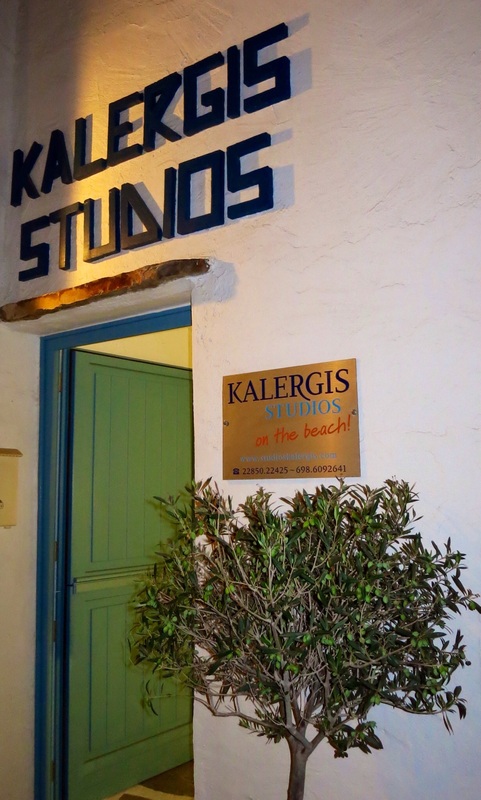 We stayed in apartment 18 at Kalergis Studios on St Georges Beach (http://www.studios-kalergis.com). This typical Greek white–washed apartment was clean and comfortable with delightful managers. We enjoyed having breakfast and sunset cocktails on our balcony. The views across the sea to Paros were always spectacular in the late afternoon, with the orange summer sun setting and the sound of Greek music drifting down the beach. 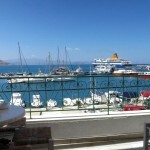 There is a huge range of accommodation in Naxos. Most people prefer to be close to town, as we did. 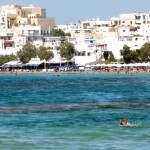 On the outer beaches of Naxos there are also good studio apartments and some newer resorts. 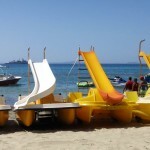 Agia Anna Beach, Plaka Beach and Agios Prokopios Beach are all popular places but if staying in these areas we would recommend you have your own transport as the beaches are a little way out of town. The sugar cube, white washed town looks beautiful from all vantage points. Warm shallow water of St George Beach. 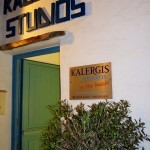 The Managers at Kalergis Studios will make your stay a very pleasant one. The main shopping area of Chora. All the action is around the port. 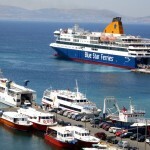 Ferries and Fastcats arrive and depart on a very regular basis from the busy port area. The old port town of Chora is fascinating, with its labyrinth of paths and passages, where getting lost is the norm and all part of the fun. In summer these streets are teaming with people until all hours of the night, seeking out the small shops, bars and restaurants which are tucked around every corner. We ate at several places in the tiny streets of the old town. Porta Tou Yialou restaurant has very good Greek food at reasonable prices, especially the homemade moussaka and grilled, BBQ fish. We also ate delicious seafood paella with a delicious, fresh peppery rocket salad, blue cheese and walnuts at a Spanish restaurant called Anda Jaleo. This restaurant has panoramic sea views and the owners are very keen to make your evening special by providing outstanding service. 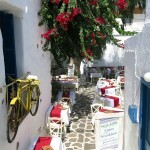 Further into the Labyrinth of ancient buildings, there are endless, charming, large and small eating places to try out. Closer to the water’s edge, dozens of street level restaurants along the Port are crowded with tourists. Some display the catch of the day, including octopus and sardines, drying in the open summer air. 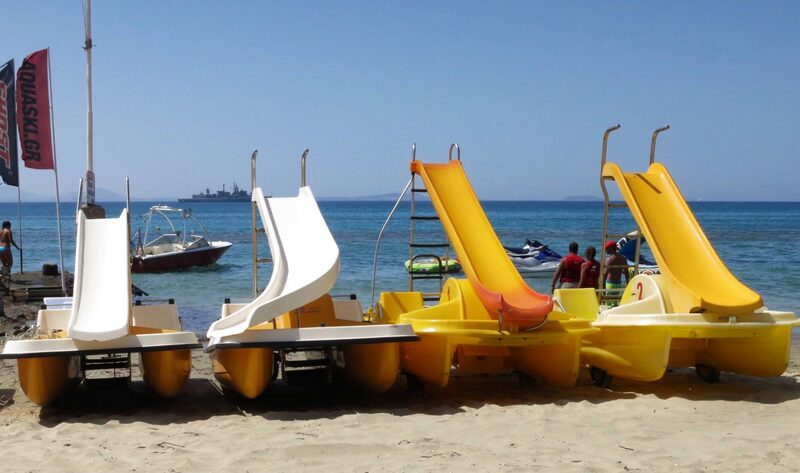 Naxos is a place to rest and play. 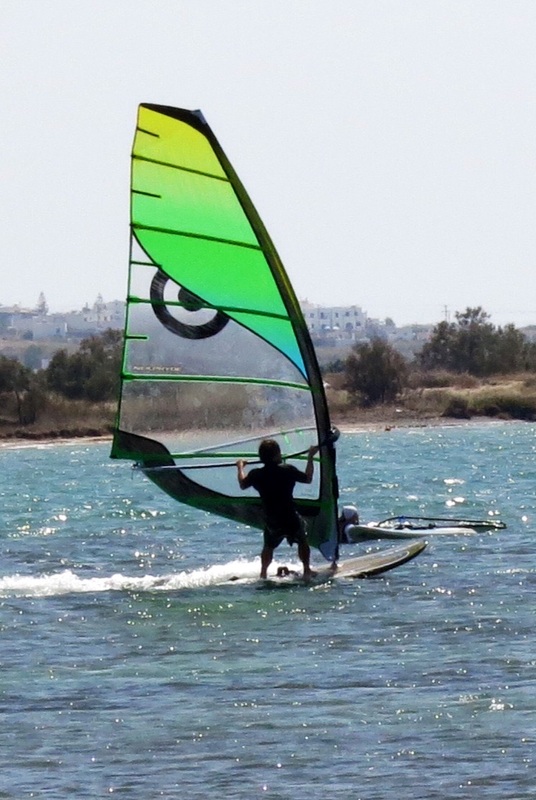 Windsurfing is very popular on the island. 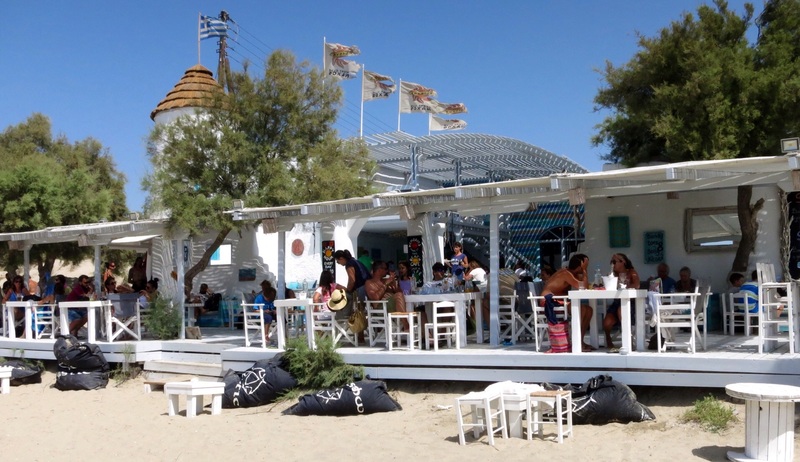 Beachfront tavernas are dotted right along the waters edge. 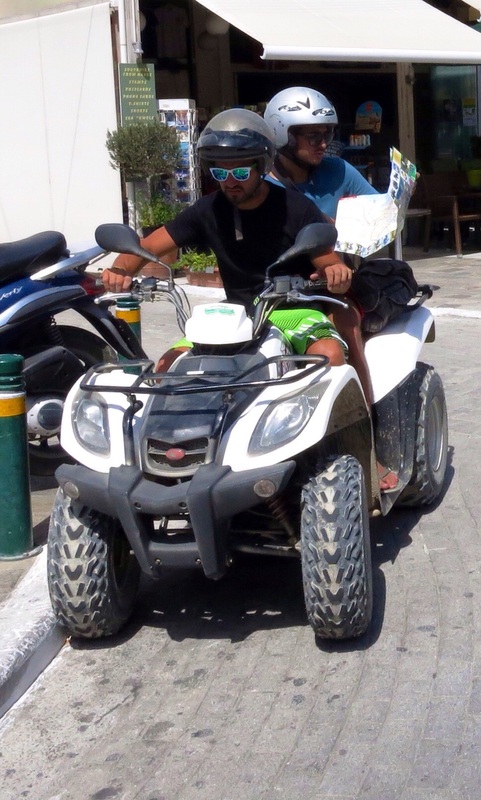 Quad bikes are a very popular form of transport on the island. The bus station near the port. Buy your tickets before you get on to go to other beaches. One morning we took a walk through the Labyrinth to find the Venetian Museum where we had the opportunity to visit a traditional castle residence. The tower house of the Della Rocca-Barozzi family was built by the Venetians at the beginning of the 13th century. This historically significant residence has a number of display rooms and a cellar which you can visit. The family still reside in a private part of the castle. 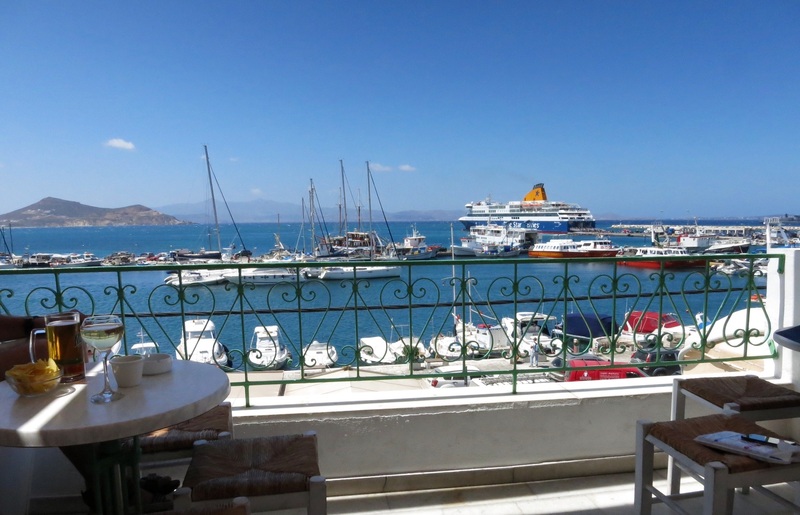 Views of Naxos from this vantage point (especially the upstairs bedrooms with the trapdoor and escape route to the old port) are spectacular. In the evening there are often recitals and solo artists performing in the castle’s courtyard. Don’t miss this museum and go in the morning before the heat of the day. 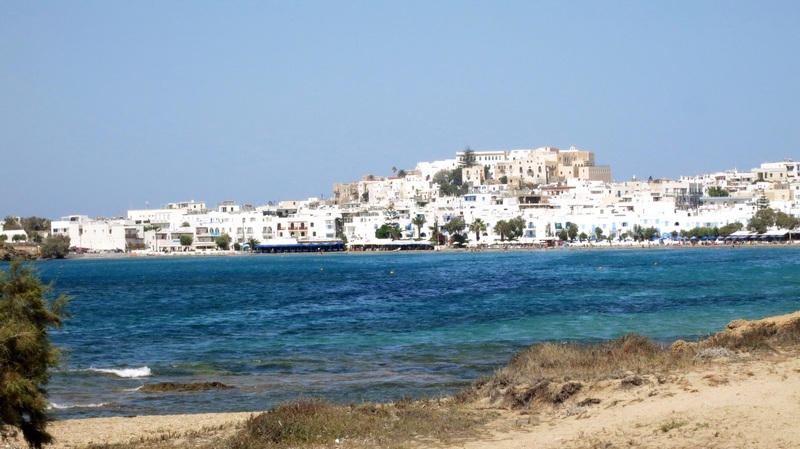 While in this area take a stroll to the end of the port area to look back at Naxos through the Portara, the entrance to a temple dedicated to Apollo, which was never finished, only the gate remains. The very best time to go here is at sunset when the view back to town is spectacular. 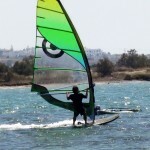 Naxos is a place for fun and action. There are places everywhere offering full day and overnight excursions, jet ski rides, wind surfing, yacht and catamaran sailing and diving around sea wrecks, stunning reefs and underwater caves for a great adventure. Quad bikes at around 60€ a day are very popular with guys who ride around the island (shirts off) to the various beaches. (See story on Picture Perfect Plaka Beach Naxos) On St Georges beach (near Kalergis Studios and Chora) there is beach volleyball in the late afternoon. 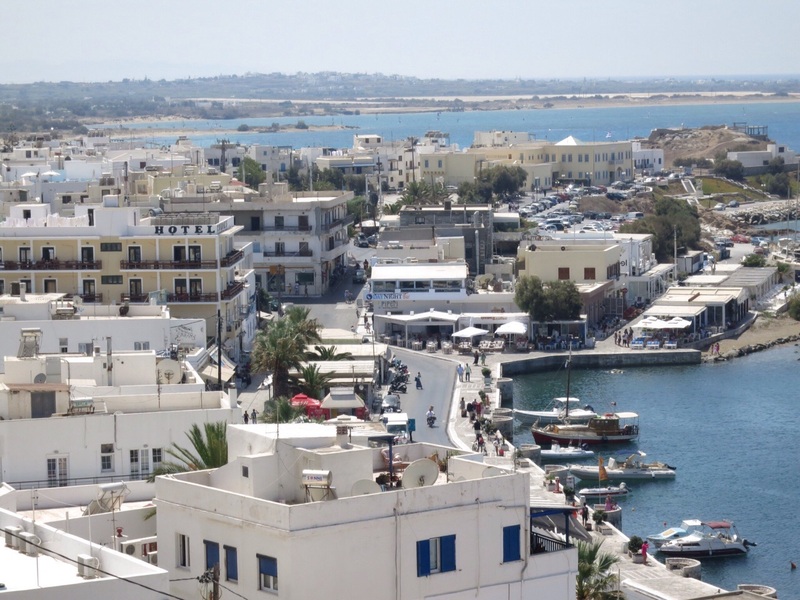 Naxos Tours offers a full day river walk (6 hours) through mountain villages and valleys, explaining how olives are grown and pressed, exploring old monasteries and sampling the local foods. 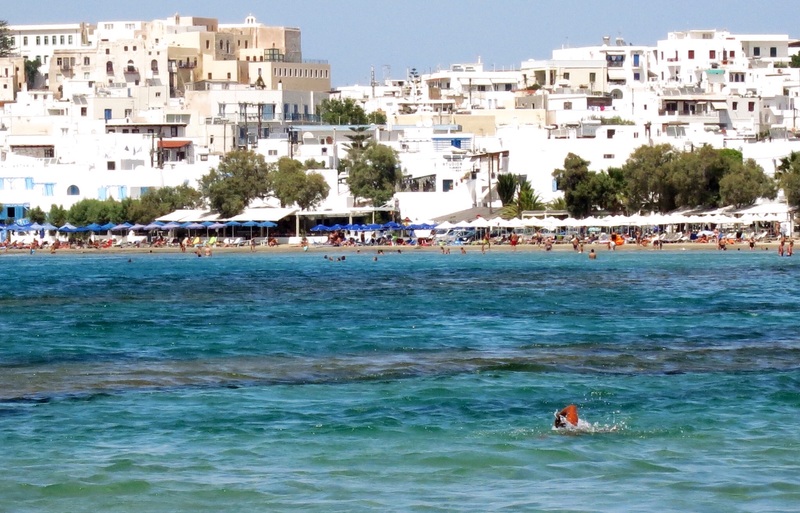 Naxos in summer and especially in the European school holidays is very crowded. 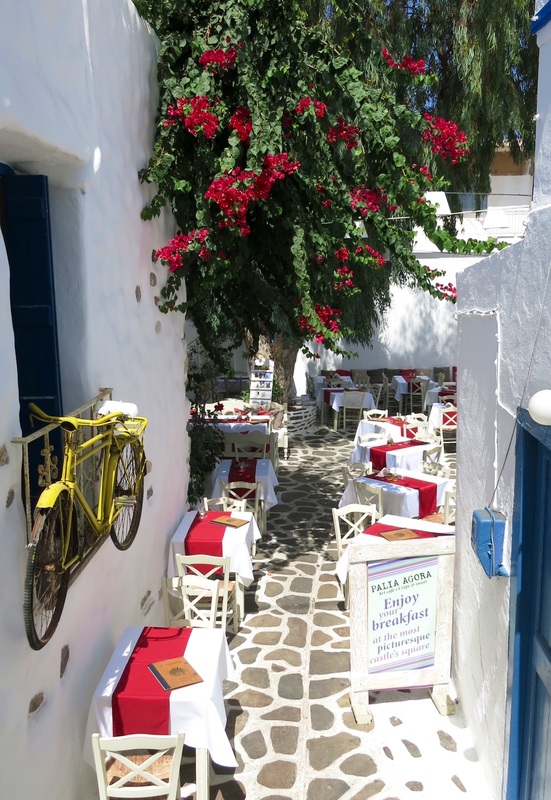 The lay back charm of the place is hard to resist and the a lure of being on a Greek island is very seductive. 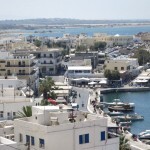 Naxos, on the whole, is a straight destination. However, this Aegean island, the largest of the Cyclades, is a special place to spend quality time with your lover/partner to unwind, slow down and catch your breath before, or after, partying in Mykonos.Ya sas! 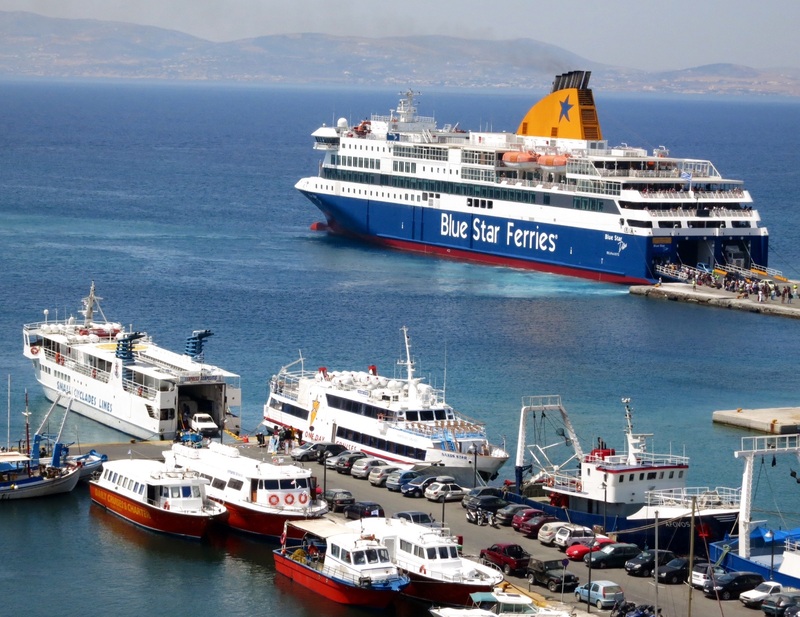 Arrange your transport from the port ahead of arriving as taxis are very difficult to get when ferries unload.